It’s been a hectic morning. In case you’ve been under a rock, Microsoft released Windows 8’s Consumer Preview earlier today, and the entire world has been scrambling to test it, and draw up some early conclusions. This post is not such an entry, but is instead a short take on the big hits to get you up to speed. First, if you want to download and install the Consumer Preview, check our directions here. Even if you have one of those fancy BUILD tablets. Now, let’s begin. 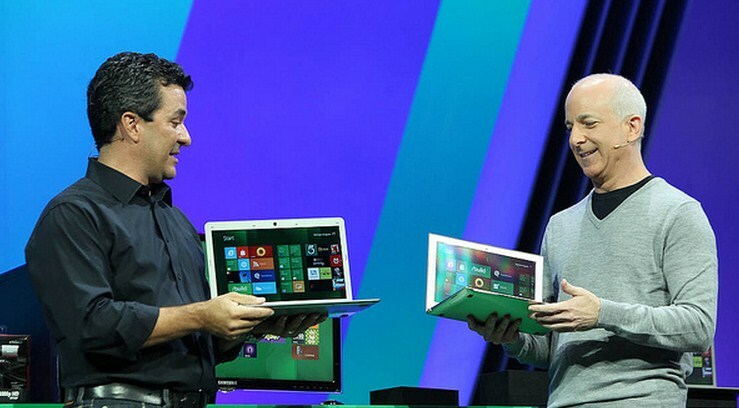 According to Microsoft, some 100,000 changes from previous versions of Windows 8 went into the Consumer Preview. That’s just a fancy way of saying ‘a lot.’ Microsoft wants to remind the world that this is pre-release software, but the fact remains that what we were given today is not a beta. Beta implies a very rough bit of software that may change greatly. With this Consumer Preview, we’re looking at a very far along example of Windows 8. Here’s how we would describe the Consumer Preview: it’s what you wished the Developer Preview had been. The features that Microsoft demoed at BUILD that were conspicuously absent are now present. If you were excited about the Developer Preview, but felt a bit let down when you got your hands on it, this edition should satiate you. What are the biggest additions? Better preview apps. This is critical. The old set of app previews were written by a cadre of interns, and it showed. You have new toys to play with in the Consumer Preview. Charms now always appear on the right side of the screen. Is that list exhaustive? Of course not, but it’s a start. You’ll have to do your own testing to get the full picture, but it is very certain that this is a much more usable operating system than the Developer Preview, a build that was constructed to allow developers, of course, to write their own Windows 8 Metro apps. If you want a few more details, Paul Thurrott has some excellent notes on a few of our listed features. TNW will be testing the Consumer Preview heavily over the next few days, so stand by for more ‘hands on’ notes. We expect to see a Release Candidate for Windows 8 in the next few months, and that the software will ‘RTM’ (reach the stage at which it can be released to manufacturers) a bit after that. Our, now somewhat dated, prognostication on the matter deduced that June 8th would be the date that Windows 8’s first edition would be complete. However, might be willing to push that back a bit, depending on how many bugs the Consumer Preview uncovers. Things to keep in mind include how quickly the new Windows Store for apps is taken up by developers, how the Consumer Preview is spun by the mainstream (by that we mean mass market) press, and how confident Microsoft appears after the new code has been floating around for a few weeks. It’s important to keep in mind that the commercial functions of the Windows Store are not yet available. TNW, and the rest of the tech press it must be said, expects Windows 8 to be on devices and in stores this holiday season. That means the code itself has to be wrapped up in time for OEMs to test it on new devices. It’s going to become even more hectic in the Windows world over the next few months, not less. What problems might we see? Just checking through initial media coverage, including our own, I wonder how well the touch elements of Windows 8 will translate to a keyboard-and-mouse setup. At least for now, the more traditional input setup remains dominant, giving Windows 8 the challenge of having its new touch interfaces be backwards compatible. I’m not sure Microsoft has put enough time into this particular problem. However, to conclude, the Consumer Preview is exactly what we expected, and that’s a good thing. It appears well featured, and is easy to download and install. We need more time to test, but our first glance has been positive. More as it comes.